Autumn does not have to be dedicated to the orange, gray and dark blue. Nike has chosen to return to the brighter tones of summer and spending trends requiring leave them in the closet until the turn of the heat. 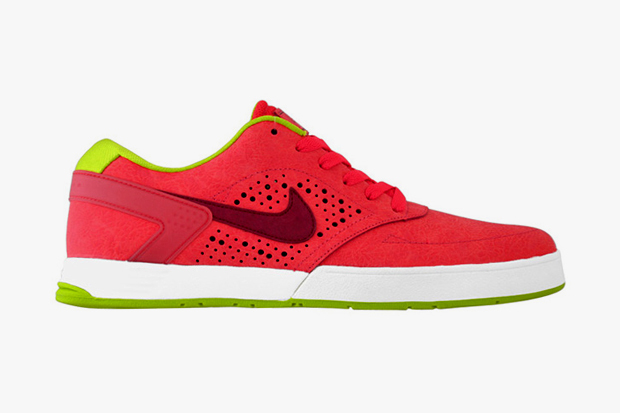 The Nike SB P-Rod 6 Sunburst relocate bright red in the street with neon lime green accents that make the color combination is stunning. For me, one of the coolest shoes of so far this season. The white rubber sole also has finished in the bottom in the same shade of green, a cherry for a super attractive and colorful design, far from the more muted tones are everywhere lately. Nike completes it with a small side pores to finish a different style. So far we have found for sale in a Korean official online store, but if you are too infatuated with them, you can buy them for $110 plus postage. Hopefully reach more countries, because they are awesome.